For me, the holiday season is all about the sugary treats that are everywhere you look. 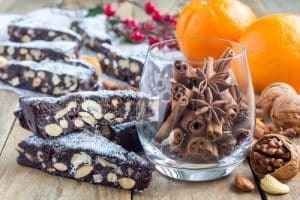 I can easily and simply make my Christmas day dinner and even my holiday party appetizers healthy and hormone-friendly without a hitch, but the sheer ubiquity of sugar this time of year truly tests my willpower and triggers those cravings. While the rest of the year a couple of squares of good quality dark chocolate can cut it, when the holidays are here I need something a bit more. I need to prepare and make sure I have everything on hand to satisfy that nagging sweet tooth. A little indulgence every now and then is an important part of self-care and the run-up to Christmas is the worst time of year to self-punishment and deprivation. I say – enjoy yourself, but in a way that will make you feel good for longer than it takes to clean your plate – which means making healthy, hormone-supporting choices. The best way to avoid unsafe and toxic ingredients is to make your own treats at home. There’s no need to scrutinize packaging and decode labels that suggest something is healthy when you know it’s probably not. Make your own, for your family, friends and for yourself and you’ll bring the Christmas cheer while taking care of your cravings. I love the idea of introducing my friends to sweet treats that are nourishing and good for your body. I wholly recommended turning up at a party with my favorite sweet potatoe brownies or challenging your friends to a Christmas cookie swap that keeps the white sugar, the gluten, and the dairy at bay. In fact, healthy sweets are one of the best ways to recruit fellow health warriors to your side and get some co-conspirators to Cycle Sync with! They’re the perfect gateway “drug” to a new way of life. Take a look at my guide to the best kinds of sweeteners to use instead of the white (or brown) stuff before you get to baking. I’ll be sharing my favorite recipes here, but I’m also a fan of keeping things simple, which for me means stocking up on easy, convenient products that help you get your sweet fix without too much fuss. I love the Crio Bru cocoa grounds you fix in your French press. Add some almond milk and nutmeg with cinnamon sprinkles and you have the best dark chocolate drink. I put it in my Holiday Gift Guide for a reason. I love to use Zema’s Madhouse baking mix to make breakfast pancakes and waffles – it’s cocoa, the ancient grain teff, and a superseed mix you can feel really good about giving to yourself and your kids. Try the black bean brownie bites, sweet potato baking mix, or apple cinnamon muffin mix – all are super nutritious, satisfying and so delicious. The company’s tagline is “treat yourself – well” and i couldn’t agree more. I’m an advocate for healthy eating, not deprivation. The wonderful thing about these mixes – it means you can definitely have more than just the one cookie! I have a ready-made, go-to list for candies that are free of toxic, hormonally-disruptive ingredients including replacements for my favorites like peanut butter M&Ms and Reese’s Pieces. It’s so simple to source healthy alternatives these days and have them delivered straight to your door. I have some go-to websites I love for inspiration for home baking. My current favorite in Bon Jon Gourmet. Many of the recipes from this ex-pastry chef are gluten-free or vegan, and so dairy-free. Many also avoid refined sugar completely. Bliss! Like this sugar-free, gluten-free, vegan no-bake lemon, berry and coconut cream tarte or these sugar-free, gluten-free, vegan no-bake hazlenut ganache brownies. Here are some of the sweet treat recipes I’ve perfected for myself over the years. Combine wet: grated sweet potato, eggs, vanilla, honey and coconut oil oil in a large mixing bowl and stir together until well incorporated. Mix dry: cacao powder, baking powder, baking soda, salt and coconut flour. Combine wet into dry and mix well. Pour the mixture into a 9 inch square baking tin lined with parchment paper. Cook for 25-30 minutes. Let cool for 10 minutes before carefully removing the brownies from the tin. Serve with raspberries or strawberries and maybe some coconut yogurt to be extra decadent. Combine all the ingredients in a 14 inch casserole baking dish. Sprinkle gluten free/sugar free plain granola on top (Udi’s or Purely Elizabeth’s). Bake at 350 for 30 min covered. Let sit 15 minutes uncovered and cool. Serve with fresh mint and coconut yogurt or a drizzle of honey. Place 8 ounces dark chocolate in a double boiler (or a bowl placed over a bit of simmering water) and melt it. Pour the chocolate over the coconut mixture and stir to combine. Let cool a few minutes and then drop by the tablespoonful onto baking sheet. Finish with a few grains of salt on top of each. The mixture will be a bit crumbly, but will set as the chocolate cools. If your kitchen is on the cool side, the clusters will set over the course of an hour or so. If you want to speed up the process a bit, pop them in the refrigerator. Pulverize 1/3 cup unsalted almonds with a food processor and set aside. Then blend a handful of dried apricots in a food processor, adding a drop of hot water to blend easier. Do the same with a handful of dates (take pits out first). Mix apricots, dates, and almonds together to form a paste. Form into balls and then roll in coconut flakes. First, have you quit sugar? Second, what are your favorite holiday recipes?